Receive up to $500.00 cash rebate on Dallas apartments for referring our free rental locating service. Complete our Dallas Apartment Cash Rebate Claim Form below to register. Our apartment locators can assist with locating community apartments in Dallas as well as lofts, condos, townhomes, and high rise apartments. We offer a cash rebate on Dallas apartments in addition to any specials or incentives individual rental apartment communities in Dallas may be offering. If you find a Dallas apartment locating agency in Dallas offering a better deal, just let us know and we'll match their offer and pay you an extra $50.00! 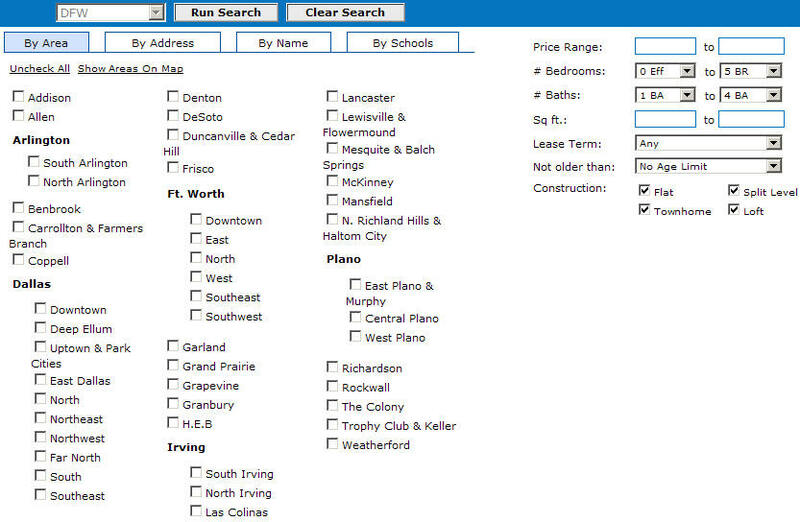 We offer a free Dallas apartment locating database with unlimited free access to thousands of apartments in the Dallas area with instant access to pictures, virtual tours, resident reviews, pricing, move in specials and discounts, maps and more. Our bonus as a 'Thank You' for informing the properties we sent you! The cash rebate is in 'addition' to any specials or discounts the properties may have and will NOT affect your rent. Cash Rebate is based on pro rated monthly rental rate. You must have learned about the apartment you lease from a DFW Urban Realty Agent. DFW Urban Realty offers up to $500.00 for referring our free rental locating services. cash rebate details An agent will contact you to discuss cash rebate incentive after you start your Dallas apartment search.